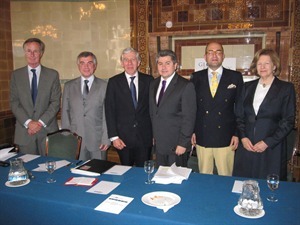 Hüseyin Gün, Sir David Logan KCMG, Mehmet Ögütçü and Baroness Nicholson of Winterbourne took part in a GSF forum to discuss the Turkish election results and their implications in a debate chaired by the Rt Hon Jack Straw MP on Tuesday 14th June. The Turkish Ambassador, HE Mr Ünal Çeviköz gave a reply. To listen to the discussion, ‘Turkey’s General Election: What Does the Outcome Mean for Britain, Europe and the Middle East?’ click here. Following the debate, Sir David Logan andMehmet Ögütçü wrote an article on Erdogan’s Legacy in his Final Term, in which they consider that the outstanding question now is‘whether the AK Party will perpetuate the pattern of advancing its own preferences at the expense of others in Turkey’s deeply divided polity or instead adopt the path of consensus-seeking’. They also express the hope that Western Europeans will not leave the field to the toxic co-conspiracy of European and Turkish opponents of Turkey’s democratic, European future but remember that they too have an important stake in the full development of Turkish democracy and stability, and that they share a common destiny with Turkey within the EU.’ Click here to download the full article. To read Hüseyin Gün’s paper on ‘Creating A Middle Eastern Economic Community’, click here to download it. The Turkish Ambassador, HE Mr Ünal Çeviköz in his Reply, welcomed the proposal of a Middle Eastern Economic Community and said that the Turkish government had been working on the concept for two years, but he said that such a grouping could not be seen as an alternative to EU membership. To read Jack Straw’s article in the Times on Tuesday 14th June (‘Erdogan’s election victory gives the lie to those who say democracy and Islam don’t mix’), in which he argues the case for Turkey’s EU membership: ‘…Turkey is now the dominant actor in the region and increasingly influential on the world stage. The UK has been honourable and strategic in its support for Turkey. Not so France, Germany and others on the Continent who have effectively blocked Turkey’s EU negotiations….The one loser from these elections is the EU. At a time when it desperately needs strong allies to help to ensure a benign outcome to the Arab Spring, it is myopic in the extreme for its leaders to appear to be turning away from the strongest, richest and most democratic state in the wider Middle East’, use this link (subscription required): http://www.thetimes.co.uk/tto/opinion/columnists/article3060935.ece#.